Will Weldon wants Phantoms to finish the regular English Premier League season with a flourish. 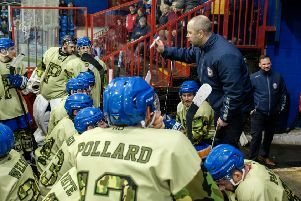 The city team claimed back-to-back wins last weekend when sinking Sheffield and Swindon to strengthen their grip on second place in the standings. And hard-working forward Weldon is determined to continue in the same vein during the remainder of the run-in. Phantoms have five games to go, starting with back-to-back away tests this weekend as a Saturday return clash in Swindon (5.45pm) is followed by a Sunday outing at basement side Bracknell (6pm). Weldon said: “The fact we are still up there and challenging at this stage of the season is very pleasing in itself. “We want to finish as high as we possibly can and we’ll set out to take maximum points from every game. “We showed last weekend that we are capable of beating Swindon and we’ve also won at their place earlier in the season. “We’re in a good stretch of results against Bracknell, but that won’t last forever and we certainly can’t take them lightly. “We have gone on winning streaks at different times during the season. When we get hot, we tend to stay hot for a while and it would be ideal if we could do that again to go into the play-offs with momentum. “We have a good record against most teams in the league. The one we have obviously struggled against is Milton Keynes, but we still managed to get the better of them when it was a do-or-die situation in the cup semi-final. Phantoms will be without forward Edgars Bebris for the Swindon clash after he was thrown out of the home success against the Wildcats last Sunday. But he will be clear to return against Bracknell.